Getting Jesus Wrong is a frank and honest narrative about how the author grew to be comfortable in his own faith. Some of his theology differs from my own, but I have respect for his ability to clearly articulate many issues with popular faith practices that he believes are making it hard for people to truly understand what God really promises and what he doesn’t. Johnson describes many modern church practices as toting Jesus as more of a positive psychology guru than a savior. The author addresses this misrepresentation of a false Jesus with examples from his personal life and then does his best to assure the reader that what Jesus truly delivers is much better than what popular culture advertises. The true, biblical Jesus doesn’t operate on a checklist or simply require a certain set of laws be followed in order for grace to be given. Getting Jesus Wrong is now available! Jesus is not a life coach, a movement leader, a cultural visionary, or a blessing dispenser—but you might not know that by listening to many Christians talk about their faith. 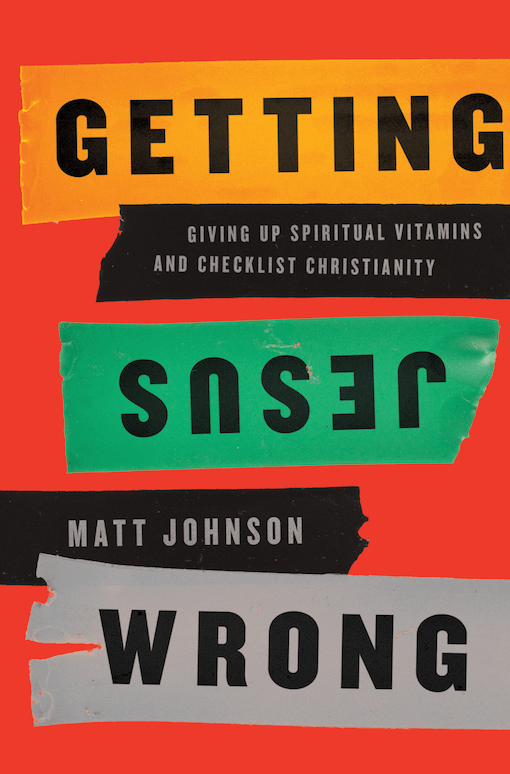 The first half of Getting Jesus Wrong recounts pastor and author Matt Johnson’s personal encounters with a string of false saviors—false saviors that many, especially young adults, will recognize. Johnson’s humor and transparency in recounting his own painful experiences will appeal to those who have tried a “brand” of Christianity and found it lacking. The truth is, we all want something from Jesus. Some are just hoping for a little help to get through life—a new direction, a purpose that will get us up in the morning, an exercise plan, a way to get organized. But that approach to Jesus doesn’t result in real faith or love. Whether we’ve followed a false Jesus or attempted to coopt the real Jesus, Getting Jesus Wrong ultimately offers us hope because it helps us see Jesus as he is. Getting Jesus Wrong shows that the message of the Bible is about Jesus coming to us as we are—which is good news for exhausted and disillusioned disciples. It shows us that getting Jesus right means a whole new way of thinking (the way up is down) and a whole new way of life (daily dependence on the one who knows the beginning from the end). Getting Jesus right gives us more than spiritual vitamins or a blueprint for living; it gives us a full, rich life spent exploring the depths of gospel love together.